Chuy’s Tex-Mex is one of my absolute favorite spots for Tex-Mex. Although it has grown into a chain, it originated in Austin and the location I go to in Houston is one of the first franchises. I go to different Tex-Mex restaurants for different things: Los Tio’s for cheese enchiladas, Lupe Tortilla for the fajitas, El Real for nachos, etc. My reasoning for loving Chuy’s the way I do is for its chile con queso and chile rellenos. The queso has roasted green chiles, which gives it a great smoky spicy flavor. The rellenos are roasted and perfectly fried Anaheim peppers stuffed with delicious melty cheese. My go-to order is a soft ground beef taco and a cheese chile relleno, double refried beans and no rice. Chuy’s has THE BEST refried beans. I don’t usually end up being able to eat the double serving of refried beans, but I always order it for leftovers. Fadi’s is a cafeteria-style line, with so many options. For example, they have about 10 different types of hummus alone. This time I got gyro, hummus, pomegranate eggplant, and dolmades (rice-stuffed grape leaves). Gyro meat is cooked on a vertical rotisserie. The most common is beef, which is what I ordered. Fadi’s has delicious homemade pita bread, it’s about 10x better than pita bread from a package-- hot, doughy and delicious. I try to order differently every time I go to Fadi’s, because everything is so good and I like to try out different things. While this isn’t an ethnic restaurant, it can be considered “Houstonian” cuisine, kind of fits, right? The first Local Foods location opened in 2011, and they already have 3 locations and are working on a fourth. Their concept is just what the name entails: the use of local ingredients. Each location is spectacularly designed, it’s the type of restaurant you love to go to because of the atmosphere (as well as the food, obviously.) Their menu consists mainly of sandwiches, salads and soups but they also have tons of delicious sides, as well as multiple vegan options. Houston is a city full of food, but the focus on local organic foods has become increasingly popular, and the fast expansion of Local Foods is proof of that. I got the Seasonal Harvest Salad with chicken. I love getting this salad because it really does use whatever ingredients are in season, so it’s different each and every time I order it. I know that many people frown upon buffets, as they usually aren’t the best quality, but this is not the case with Bombay Brasserie. Silver ornate chafing dishes and white tablecloths are what you get at this lunch buffet. Why do I love going to the buffet versus going for dinner? 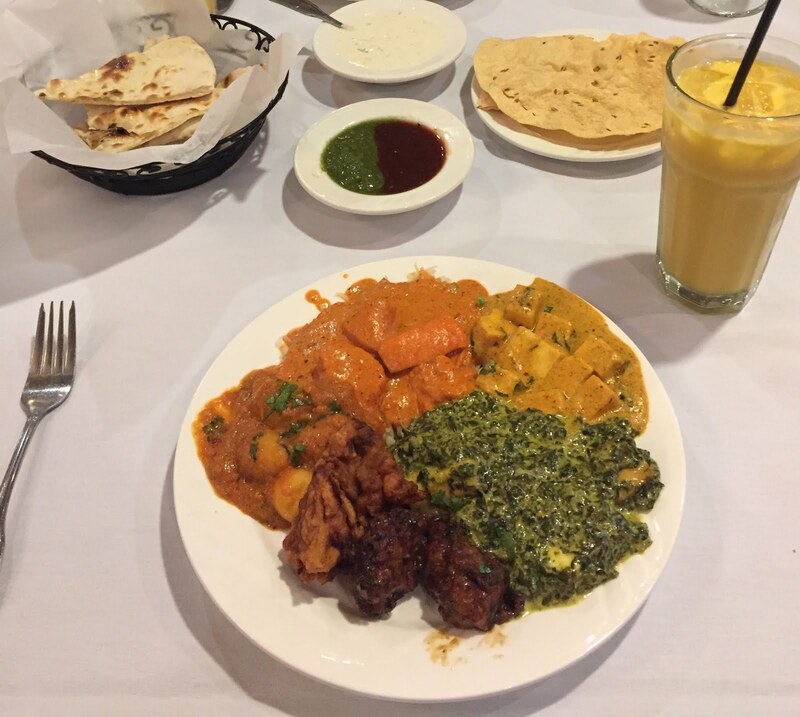 The Indian cuisine has so many different dishes and unless you go with a larger group for dinner, you won’t get to try different ones. It is a cuisine best served family style, but I typically am eating out with one parent or the other. That doesn’t enable you to be able to order in typical “family style” fashion so the buffet is perfect. It’s all served with warm Naan, traditional Indian flatbread similar to pita, and poppadum, a thin, giant, round Indian cracker (typically made from lentils or chickpeas.) My all time favorite dishes are Saag Paneer, a creamed spinach with cubes of paneer cheese (a cheese used in many Indian dishes), and Chicken Tikka Masala, cubes of roasted chicken in a creamy tomato and butter sauce. I also can’t go to the Bombay Brasserie without ordering a Mango Lassie to drink. It’s a mango yogurt drink that is perfect in cooling your mouth down from the many spices in the food. My last stop of the weekend was Thai Cottage, my favorite Thai restaurant. 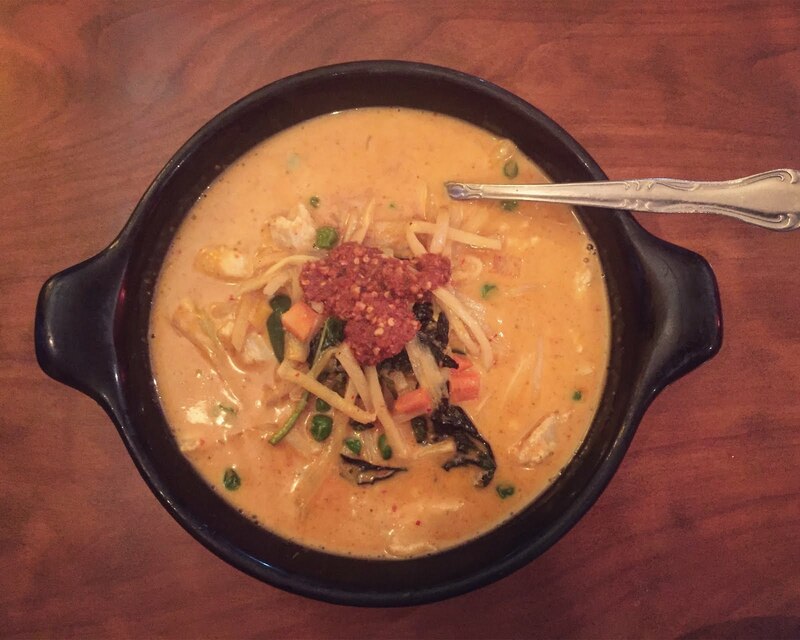 I almost always order the Red Chicken Curry; because it is so good I have a difficult time straying from it. Thai red curry is very different from Indian curry. It is soupier and made with red curry paste, coconut milk, bamboo shoots, peas, carrots and basil served with rice. If you didn’t know any better you would think it was full of cream, but its smooth, velvety texture comes from the coconut milk. When ordering, you tell the waiter which spice level you want, from one to five. I opt for level three, which is pretty spicy but not so spicy that you can’t enjoy the food. Thai cottage has nine Houston area locations, so no matter what part of town you’re staying in, there will likely be a Thai Cottage in the vicinity. These are just a handful of my favorite Houston spots that I miss dearly when I’m in Baton Rouge. I hit up most of these places every time I’m back in H-town. If you find yourself in Houston anytime soon, check any (or all) of these out. You’ll thank me later.